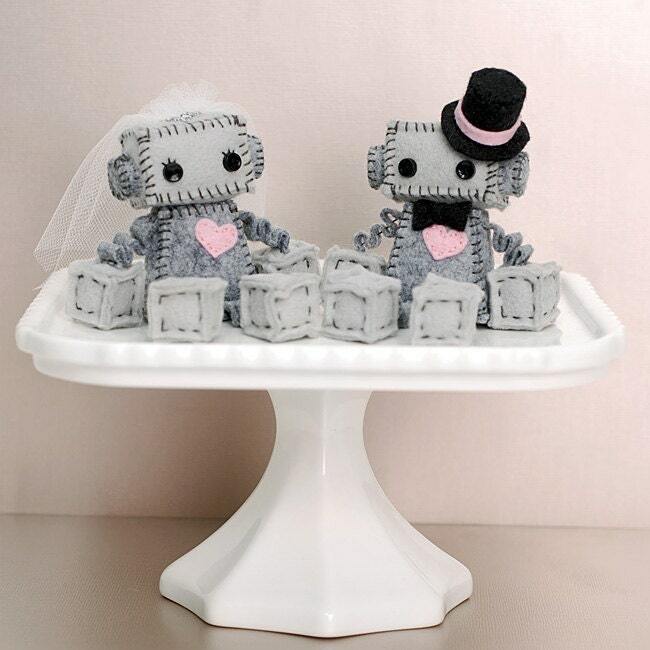 Show off your Geek Love with these little bride and groom robot cake toppers. They would be perfect for your geek or robot themed wedding. The robots shown have pink details, but these are made to order and can be made with different colors. Just let me know. They are about 2 and 3/4 inches tall when sitting. The groom has a little top hat and bow tie. The bride has a veil with silver French knots. They both have little felt hearts. These are so much cuter than I ever could have dreamed. High quality with zero flaws. Super cute and well made! Will go perfectly on the wedding cake! Thank you for the wonderful service and quick responses! Highly recommended!